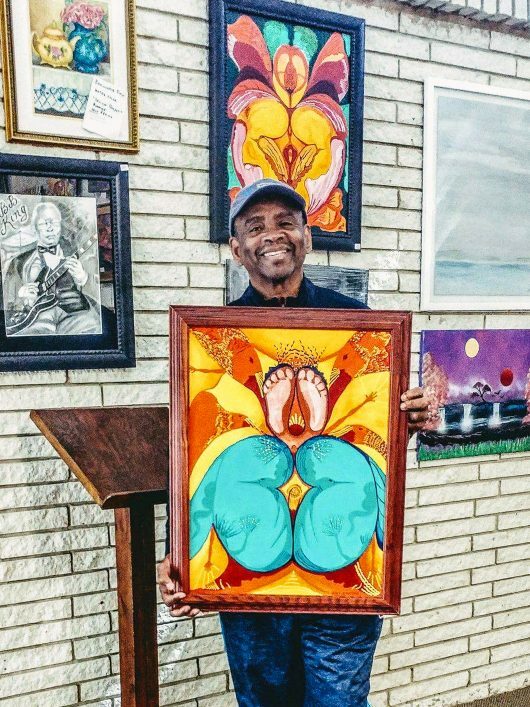 One of the Emerald Coasts’ best kept secrets aptly describes the artist Arthur Jenkins of “Creative Innervisions by Art Jenkins”. Whether known as Mr. J (of Mr. J’s Barber Shop) or just Art in the community of Ft. Walton Beach, he’s well respected and loved by many. Hailing from Richmond, VA, he is a transplant to the Emerald Coast courtesy of the US Air Force. Since his arrival to Florida, he’s impressed and thrilled local art lovers with his bold and unique brand; creating the unusually intricate yet thought-provoking works that inspire all who view them. Combining his passion for acrylic painting, charcoal and ink drawings, he endeavors to creatively express a cultural and artistic body of work that depicts abstract things and how they relate to the physical world. He sees things like no other, thus what is reflected throughout his pieces can truly be defined as his stylistic “Innervisions”. His paintings have been described as beautiful, bold and full of vibrant color! Melding warm yellows, deep reds, purples and cool hues of blues; the subject matter is often spiritual and deeply cultural but always fun and original. Art Jenkins has been widely acknowledged for his countless contributions to art shows, contests and festivals locally and in other cities in the panhandle region of our state. Though honored with numerous awards from the elite of Northwest Florida’s professional art communities, he remains humbled and grateful for the gifts and talents he possesses.